ETL (extract, transform, load) and MDM (master data management) for the asset management industry, tailored to process and reconcile all of your complex, industry-specific feeds. Effectively manages and unites data for entities, trades, assets, accounts, market share, flow, and more. True master data management (MDM) requires bringing all of your enterprise data together, ensuring the data is appropriately validated in the process, and providing your organization with a single trustworthy system of record. MDM is difficult in any industry, but with the ever-growing number of third-party and proprietary intelligence data sources available to asset managers, maintaining one golden source of data is a tremendous challenge. SalesPage solves this challenge with uniquely responsive and ever-evolving MDM tools. Different distribution channels require different data structures for the entities they track. Out of the box, we support a 4-tier hierarchy for the intermediary channel, a many-to-many hierarchy for institutional and other channels, and a 2-tier (person/household) hierarchy for the direct retail channel. SalesPage supports entities found only in asset management, such as teams, partnerships, custodians, households, and more. Automated import, validation, resolution, and allocation of data related to trades and assets as well as non-production data streamlines data governance processes and puts critical data in front of sales as quickly as possible. This resolution toolset allows SalesPage to present daily sales, redemptions, and asset flows. You can quickly see and act on activity within your channel or territory. Collect, aggregate, and manage multiple versions of your entities from both upstream and downstream systems. Perspectives allow your governance team to reconcile the information from your transfer agent, your data pack providers, your market share provider, your marketing team, and your field sales team into a single client data platform. One with the most accurate version of the data. 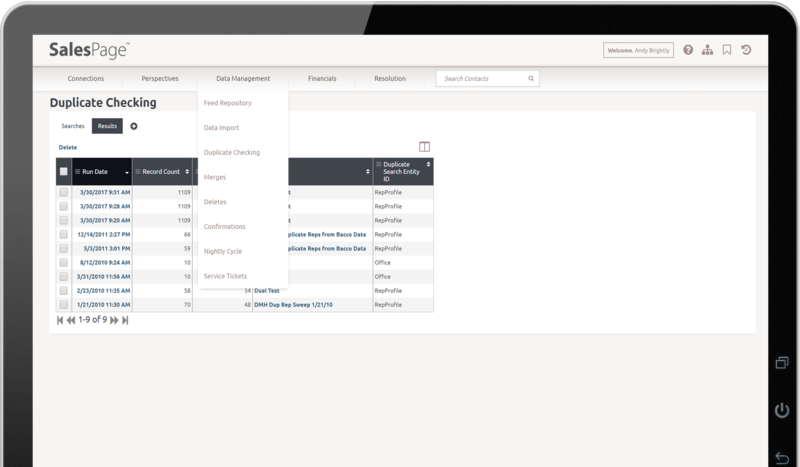 Control how entity data flows into the system and affects your system of record at the source and record level. We support multiple approaches for curating and propagating your entity and trade data to your downstream systems. Leverage SalesPage to implement sales, marketing, expense tracking, and compensation with more accuracy and reliability. Track and manage financial advisor teams. By establishing connections and leveraging underlying production and activity data, we help you identify, target, and sell to teams. SalesPage also offers Advisor Atlas team data, as an optional bundle that provides the best team data, at an affordable cost. Want to know more about MDM?